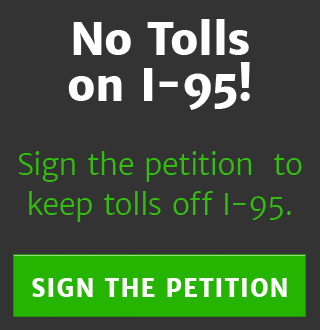 We need to put an end to plans for tolls on I-95 and we need your help! January 2012, then-Governor Bev Perdue and the North Carolina Department of Transportation (NCDOT) released the I-95 Corridor Planning & Finance Study identifying tolling as the most feasible means for funding future improvements of Interstate 95 in North Carolina. 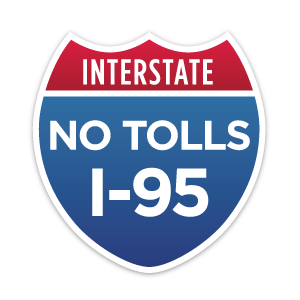 Prior to the release of the I-95 Study, NCDOT submitted an application to the Federal Highway Administration requesting approval to implement tolling on the I-95 Corridor under the Interstate System Reconstruction & Rehabilitation Pilot Program. Current plans call for toll collection to start on the full 182 miles of I-95 in 2019 and drivers would pay a rate expected in 2019 to be around 19.2 cents a mile. That means a trip from North Carolina to Virginia would cost $19.20 for a two-axle vehicle. Larger trucks would pay higher rates. Interstate 95 is the primary transportation artery in North Carolina and a major catalyst for tourism and economic development. During his campaign, Governor Pat McCrory public stated his opposition to tolls on I-95. Now is the time for him to rescind North Carolina’s application to the Federal Highway Administration and the North Carolina General Assembly to pass legislation against tolling existing roads. The I-95 Corridor Planning & Finance Study reveals that 30% of the travelers on the I-95 Corridor will divert to other roads to avoid tolls. The 30% diversion rate represents the loss of 12,000 cars a day, which will have a significant negative impact for communities and businesses that depend on I-95 travelers for their livelihood.